The ultimate Doctor Who toy has arrived, but it might have unintended consequences on the kids that play with it. The Daleks are the mortal enemy of Doctor Who and someday hope to exterminate all life in the universe. How would you like your children to drive one around the neighborhood? Now they can, thanks to Zappies' Ride-In Dalek toys. Don't get me wrong, this is one of the coolest things I've ever seen, but it's pretty funny to see a few kids that can't be a day over 7 giggling while playing with a Dalek. Daleks are cyborgs basically designed to roll around and kill everything they find without emotion, so I had never thought about popping a toddler inside of one. 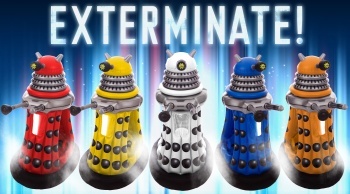 Zappies plans to release its Ride-In Daleks this June in the UK toy market, but they can also be ordered online. Right now it looks like they come in five different colors for Â£199.99 ($317) each. The Daleks are battery operated, over 4 feet tall, and emit 10 sounds and phrases. "So, Billy, did you have fun at your playdate?" "Yes, Mom. We exterminated all of humanity and killed off Doctor Who once and for all. Today, Earth, tomorrow, the universe!"